Last summer's mystery explosion in Central Park is never far from the minds of ATF Special Agent Pete D’Antonio and NYPD Detective Andrew Cohen. Chris Glorioso reports. 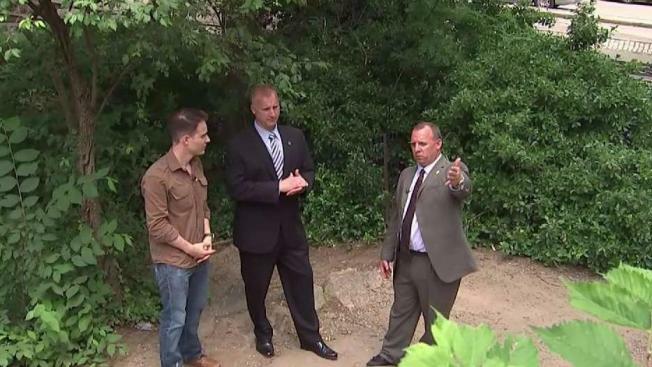 Last summer's mystery explosion in Central Park is never far from the minds of ATF Special Agent Pete D’Antonio and NYPD Detective Andrew Cohen. Both men are fathers. And neither can imagine the pain of seeing a child lose a limb. The pair of investigators took the I-Team back to the scene of the July 3, 2016 blast that claimed Connor Golden’s lower leg. The individual who left the explosive compound has never been apprehended. And D'Antonio and Cohen are calling on the public to help heat up the year-old cold case. On that fateful summer day, Golden, then a University of Miami freshman, jumped off a rock formation near the Central Park entrance by Fifth Avenue in the vicinity of 60th Street. When he landed, the device someone had left on the ground blew off his lower leg. Connor now walks with the help of a prosthesis. On July 3, 2016, Connor Golden, then a University of Miami freshman, jumped off a rock formation near the Central Park entrance by Fifth Avenue in the vicinity of 60th Street. When he landed, the device someone had left on the ground blew off his lower leg. Although Cohen and D’Antonio have viewed hours of surveillance video and countless images, they have not been able to track down the elusive suspect. "We will find them. We're looking for them," Cohen said. D'Antonio said what happen to Golden strikes a chord. "What makes it a little harder for me is that I have three children that are around Connor’s age," he said. It could have happened to any of my own kids stepping off that rock." For fear of inspiring copycat explosions, both the NYPD and ATF have avoided naming the specific compound that blew off Golden's lower leg. Investigators say at this time, they have no evidence to indicate the explosion was linked to foreign or domestic terrorism. Golden's family is skeptical. Last fall, in an exclusive I-Team interview, Connor Golden's family expressed doubt the explosion could have been a mistake or an accident. In July, Connor Golden, 19, lost his lower leg after an explosive compound blew up in Central Park. Since then he’s been fighting with United Healthcare to cover payment for his new prosthetic. Chris Glorioso reports. "These explanations that somehow someone was playing with these materials in the park makes no sense to me,” Kevin Golden, Connor's father, said at the time. “In one of the most watched areas of the country ... you don't go there with this volatile compound that is explosive on contact." Connor Golden has so far declined to speak publicly about the blast that took his lower leg, but his family has become increasingly concerned that the unsolved explosion case is fading from public consciousness. The family has tried to use a GoFundMe page to reach out to the public directly. They’ve also raised more than $85,000 for future medical expenses not covered by insurance. The I-Team was first to reveal how insurance claims for Connor’s prosthesis have been denied and delayed. With no person or group claiming responsibility for the explosion, Cohen and D’Antonio believe there is at least one way to warm up this cold case: They want new images of those Central Park rocks. The investigators believe members of the public almost certainly have photographs or video on their phones of the days and hours before the explosion. If those images have the rock formation in the background, they could help narrow down exactly when the explosive compound was placed on the ground. With a more precise time frame, investigators may have better luck pinpointing the person who brought the explosive into Central Park. "If they were around here during that time frame, that’s what we want them to reach back into. We want them to look at photos that they have," Cohen said.